They taste of history and of memory, they taste of love, and they taste of butter. They taste of mom, who made them on special occasions. They taste of Nana Bea who would help make them on her annual visits from Chicago or Florida. 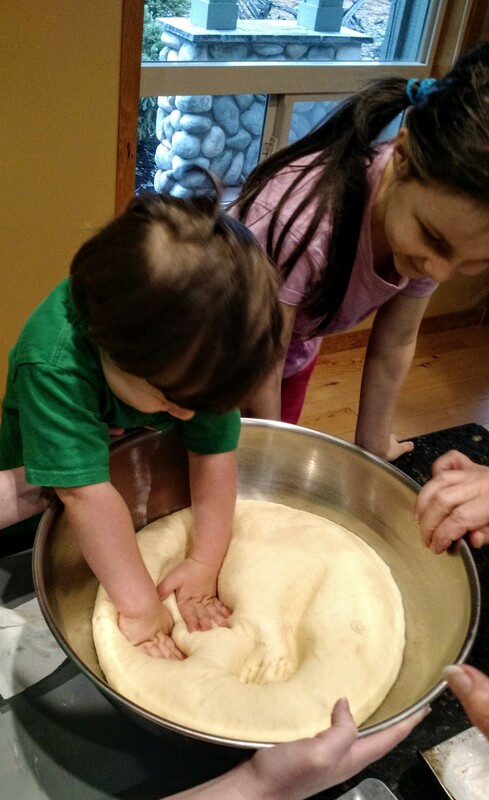 Nothing but milk and eggs, flour and yeast, a little sugar and a lot of butter, but a favorite now of four generations. We’ve made Butterhorn Rolls from scratch every Thanksgiving since time began. Grease stained, well used, with modern edits. Mom typed up her recipes when she got her an IBM Selectric electric typewriter. There were always mysteries, trying to decide what she meant by any one direction or ingredient. Shortening? My memory of these rolls is sensory rather than of words, recipe steps, lightly tinged with the emotional baggage of childhood. 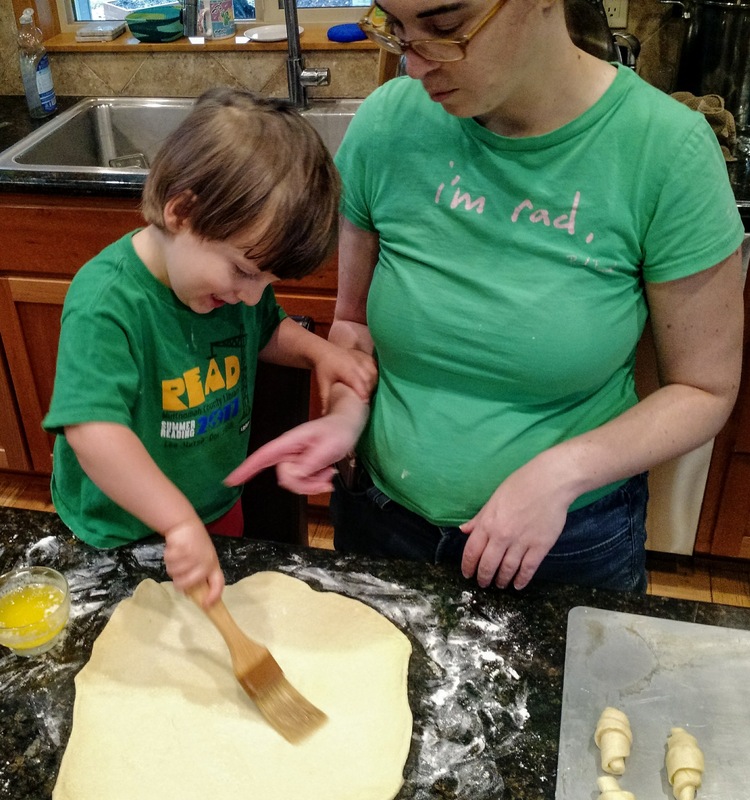 Making rolls was a rare moment of parallel play with my mother, when smells and tastes were pleasant, and the warmth of the kitchen could be taken to be the warmth of my mother. Indeed, my mother’s way to love us was to cook delicious food. When we were upset, giving us food was how she made us feel better, a lasting legacy. Mom’s meals were a cross of warm succulence and 60s-style nutrition, sometimes from a can or box, but always balancing a variety of meat, vegetable, starch, and mostly appreciated. We ate at the kitchen table most nights, and there was dessert every night too. Our favorites came from a box, tapioca or Jell-O Pudding in chocolate, butterscotch or vanilla. Or, there were any one of her famous cookies, which inexplicably never came from a box. When it came to baking, it was always from scratch, always fresh ingredients, creating something from nothing, a spectacular adult feat. Most famously, her brownies were a popular fixture at every gathering. She made them so frequently that when people complimented her she would shrug and say, “They’re so easy!” There was usually a batch of brownies in the freezer, just in case, and the joy of sneaking one or two couldn’t be overrated. She didn’t understand the stolen pleasure, and the icy resistance of sinking teeth into chocolate fudgy sweetness is still an exquisite memory. My siblings and I competed to lick the bowl and later, my children. When mom died unexpectedly, just shy of turning 70, there were a few brownies left in the freezer, which we ate mournfully, ceremoniously. I think about that whenever I make brownies, a role that’s now fallen to me. I inherited the scratched and dented metal baking pan for that mom-authentic taste and texture, and my family is always grateful for them. They exclaim, “They’re so good!” and I just shrug and tell them, “They’re so easy! Three generations at work, getting started, still clean. 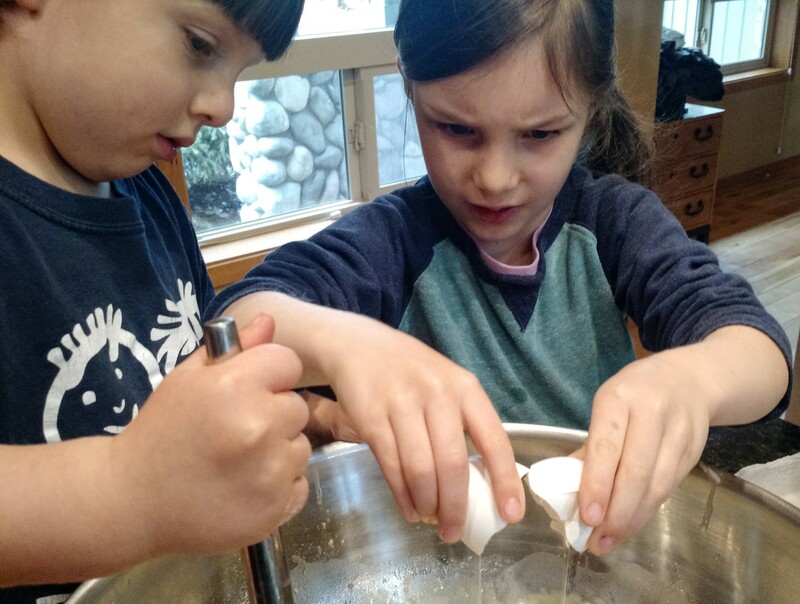 Butterhorn rolls however, are not so easy, and thankfully this task falls to my sister, my daughter, and even to my husband, who somehow naturally steps in as needed. The process is an all-day enterprise. The first one awake prepares the yeast and scalds the milk, watching it diligently so it doesn’t burn, something I never could manage. Once the yeast has done it’s magical yeasty thing, the fun begins. 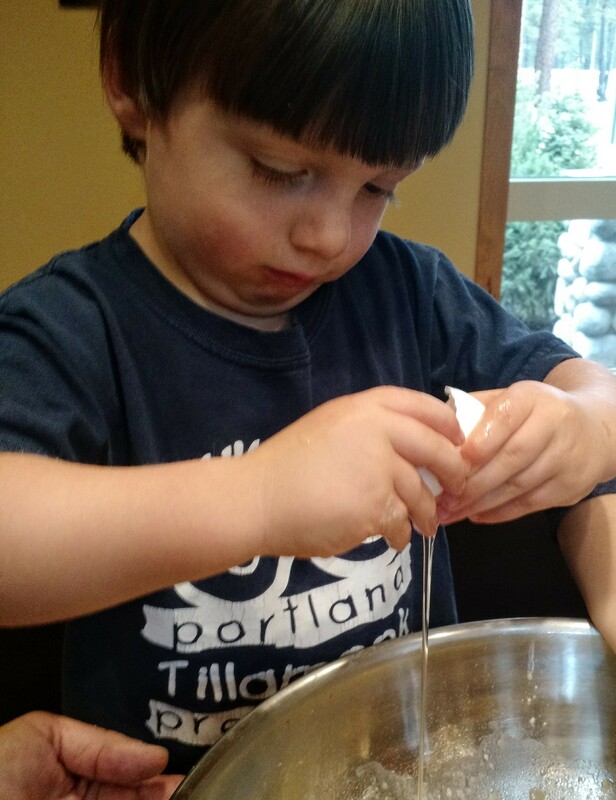 Cracking eggs is a rite of passage for the young, finally trusted to do something difficult and delicate, with so many ways to do it wrong. Success balances somewhere between tap and tap and tap, tap tap tap, and smashing the whole thing, but there are several chances to try, try again. 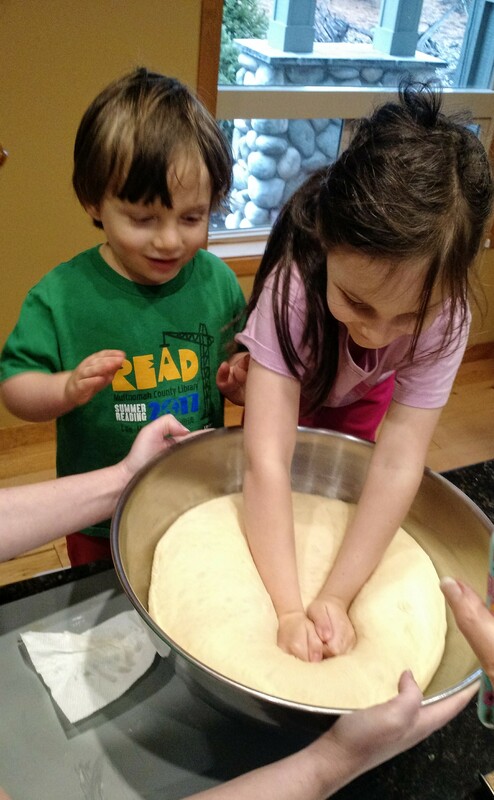 It’s all hands on deck now for a total body experience, spreading flour, folding, pushing, prodding, mashing, poking, squeezing, pounding, extra fun because of the usually forbidden mess, flour flying everywhere. The dough’s resistance, texture, and elasticity is irresistible, and if you think no one is looking, pinching off a bit to nibble is subversively delicious. As a child I would eat all I could away with, even polishing off an entire raw roll, a peak experience that can never be re-lived as an adult. 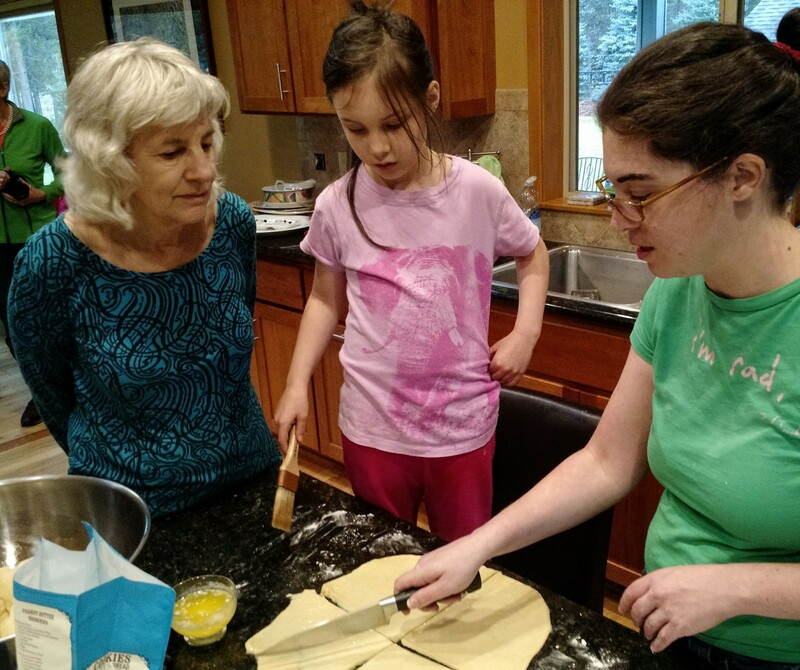 The dough rises, and we change out of floury clothes, turn to other things, a walk outdoors, music, reading, a few hands of cribbage. 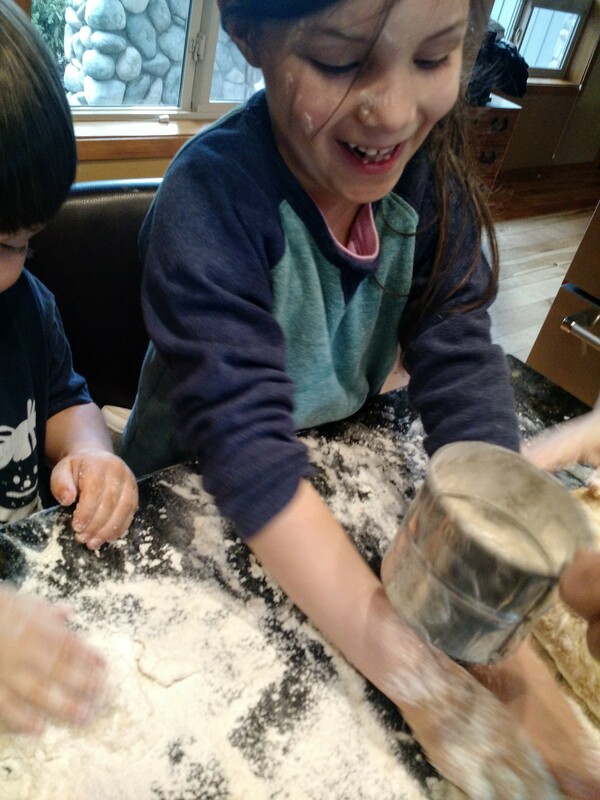 Finally, the magic moment of the very satisfying PUNCH arrives, sinking your fist into the miraculously enormous ball of dough, where the ‘yeast farts’, as my daughter refers to them to her children’s amusement, have done their work creating a soft, light, airy dough. The math tricks begin, the 5 year old concentrates. 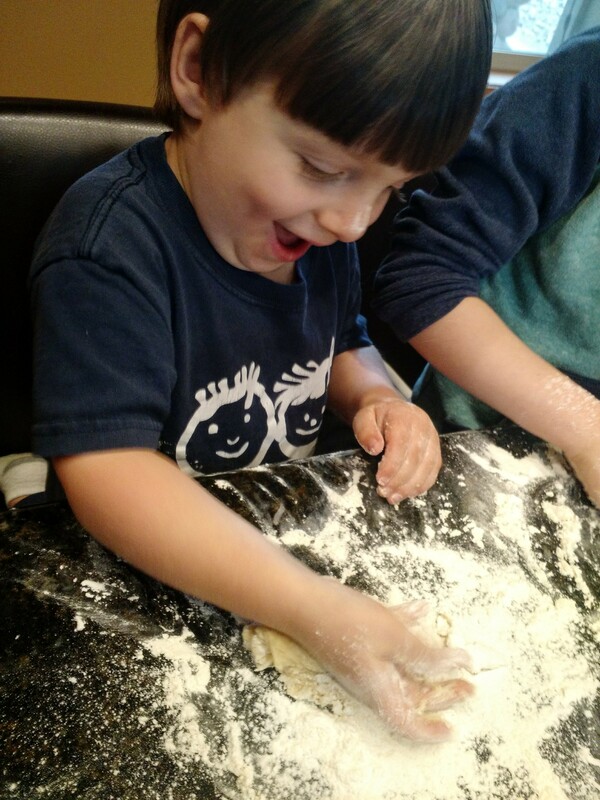 Divide the dough into equal-sized balls, roll out the balls into circles, cut each circle into triangular shapes. My mother’s haphazard way of cutting drove me crazy, so it became my job. 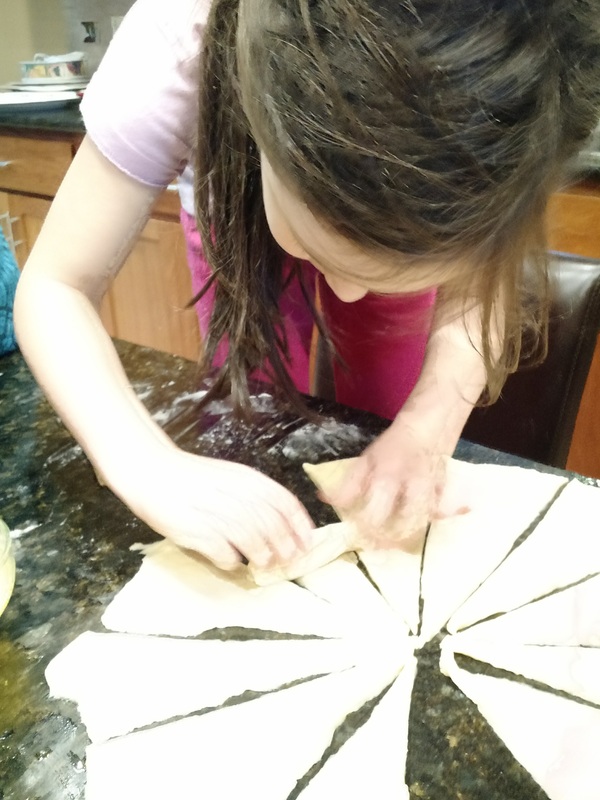 My daughter, like me, methodically cuts halves, quarters, twelfths, uniform sizes around the circle. 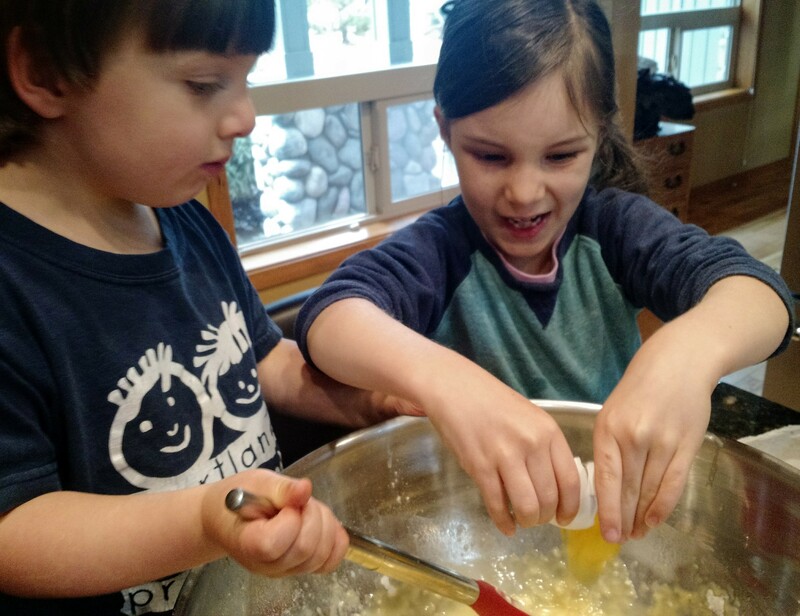 The kids brush melted butter onto each triangle as if they are van Gogh, slathering on as much of the warm, golden, fatty liquid as they can. We try modeling proper technique with sparser strokes, a lighter hand, but secretly, theirs are the rolls I hope to eat. Another rising, the baking, and the end draws near, exhaustion, anticipation, the final reward. The young eating as many as they can, the elders eating one (or two) more than they can. Every time. The rolls live large in our family. Whether to double or triple the recipe is fiercely debated: how much is enough, are there ever too many? Are there enough for second night leftovers? My brother who couldn’t be with us this Thanksgiving asked me first thing, “How were the rolls?” Finding a few extras on the third day that someone judiciously stashed away is a pinnacle moment, treasured in their scarcity, and savored, like those last lonely brownies in the freezer. Sweet, love making you cry. Tell them to invite me when they’re baking. Reading your descriptions made me feel as if I were there in that warm loving kitchen! Lovely writing. It’s so nice that your grandkids will someday (as grownups) read your own words regarding this special tradition. Likewise, some of my favorite memories with my dear mother involved baking. In summertime Heath we often had numerous thunderstorm on July afternoons when my mother would suddenly decide that we should make bread and churn butter at the same time to be spread on the bread an hour later, when the bread had been finally baked. This kept all of us kids inside during the thunderstorms, (which terrified my mother) and left us with a delectable baking reason to continue to work/bake inside. We had a glass butter churn (with a wooden interior churn/paddle) which my mother had bought at a nearby auction for .25 cents much earlier. We could churn butter in a very short time. What a great story, one I’ve never heard. Perhaps we’ll have to start churning butter too, but only if we can find a cow to help out.